How do you turn a Fiat into a Chrysler? The Chrysler-Fiat plan to sell reworked Fiats and Alfa Romeos in the United States will require more than cosmetic changes. The vehicles will need various engineering changes to meet U.S. standards. According to the Chrysler viability plan submitted to the Treasury Department in February, six Fiat-based vehicles will be sold as Chrysler, Dodge or Jeep models beginning in 2011. Most will go on sale in 2012. Analyst Jim Hall of consulting firm 2953 Analytics in suburban Detroit says the process to make the vehicles suitable for the United States, called homologation, will take about 18 months. In April, Frank Klegon, executive vice president of product development, said Chrysler is looking at the task of homologating Fiat vehicles. Last week, a source said a group of 20 senior Fiat engineers visited Auburn Hills to start merging the companies' product development. 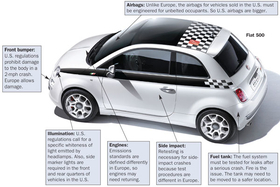 This graphic shows the major changes needed to homologate Fiat vehicles.